2018 is the year of the Earth dog in the Chinese zodiac. The new year brings the energy to start new things, helping us to put long held plans in motion. I love eating dumplings at any time of the year, but how exciting to learn that it is an auspicious activity at Chinese New Year, bringing luck and prosperity. I usually avoid gluten but make an exception for dumplings – so far I am yet to find a serviceable gluten-free alternative. Like many good things, dumplings are time intensive, but do as I do and treat it as an exercise in flow meditation. There are lots of good YouTube videos if you need help with your dumpling primping. Place about 2 teaspoons of filling in the centre of the dumpling wrapper. Moisten the edge of half the wrapper with water. 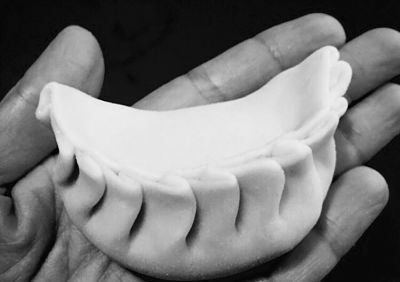 Press the dumpling into a half circle shape, poking in any escaping filling as you go. Make a few pleats in the edge of the pastry – this will help keep the dumpling sealed as it cooks, as well as making it look pretty. Shape your dumpling so the pleated side is sitting up and the bottom is flat.